Be sure to register early and plan to attend "Applied Kinesiology Protocol for Immediately Boosting the Immune System " with Dr. Eugene Charles, DC, DIBAK on Friday, July 21 from 8:10 AM to 9:10 AM, Concurrent B. 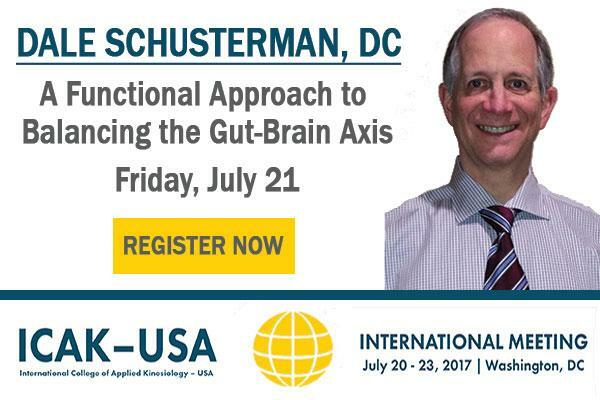 Be sure to register early and plan to attend "A Functional Approach to Balancing the Gut-Brain Axis" with Dale Schusterman, DC, DIBAK on Friday, July 21 from 2:30 PM to 3:30 PM, Concurrent A. Be sure to register early and plan to attend "Concussion – An AK Perspective on Interventions " with Dr. Tyran Mincey, DC, BS on Friday, July 21 from 1:30 PM to 2:00 PM, Concurrent A. Be sure to register early and plan to attend "Case Histories and What AK Can Do" with Drs. Michael Lebowitz, DC & Noah Lebowitz, DC on Thursday, July 20 from 2:30 PM - 3:30 PM.